Plaster cast of a Tanis deposit fossil showing a freshwater fish (dark brown) next to a marine ammonite (iridescence at top left). We know that a large asteroid struck the Earth 66 million years ago, and around the same time, the dinosaurs went extinct. We’re not completely sure whether the asteroid was solely responsible for the mass extinction, but you might ask, “Shouldn’t we see remnants of animals killed by the asteroid’s effects?” Well, now we have found some. 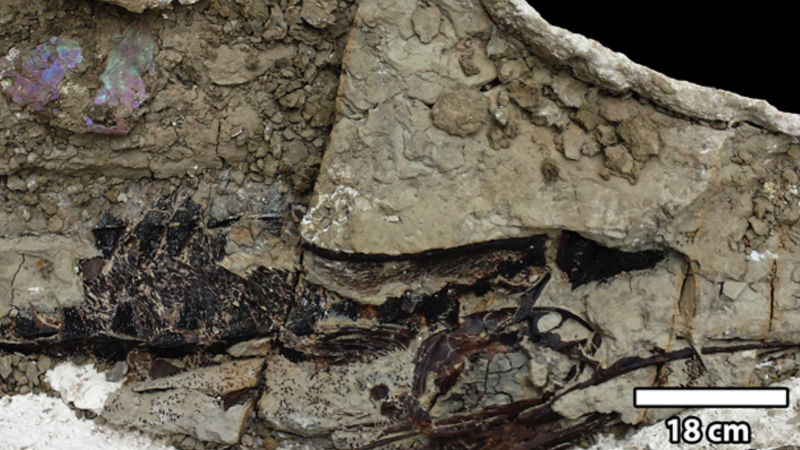 “This is the last day of the Cretaceous,” David Burnham, professor in the Department of Geology at the University of Kansas and one of the study’s authors, told Gizmodo. When a giant meteorite strikes, you’d expect chaotic effects, like rocks altered by the impact’s high pressures and temperatures, enormous earthquakes, and tsunamis. But Earth’s rocks don’t directly preserve single days of the planet’s several billion-year-old history. You’ve got to get creative when it comes to teasing apart the geologic record. For example, around the world, layers of rock 66 million years old seem to contain excess iridium, presumably deposited by the Chicxulub impactor that struck near what is today the Yucatán Peninsula of Mexico. Then there are tektites, small, glassy spheres of compressed and heated rock. Theoretically, there should also be fossilized evidence of animals killed by the asteroid’s effects. This is what makes the new research, led by Robert DePalma at the University of Kansas, so exciting—the description of a pair of sediment layers at the Tanis site of the The Hell Creek Formation in southwestern North Dakota. Both layers contain an excess of iridium, but only the lower level contains glass pieces that seemed to have been deposited from an inland-moving force. They take this to mean that they’re observing two events: The upper layer is the settling dust from after the impact. The lower is a large deposit of sediment from the hours following the impact. But if the rocks alone don’t convince you, perhaps the fossils in the event deposit will. A large swath of ocean traveled up the interior of the United States during the late Cretaceous, terminating not far from the Tanis region. But the rocks at Tanis preserve a mixture of both freshwater fish, like paddlefish and sturgeon, and marine mollusks called ammonites—implying that around this time, the ocean had mixed with freshwater rivers. And lodged inside the fossilized paddlefish’s gills were more of the glass spherules. It appeared that waves containing shocked glass from the impact over 3,050 kilometers (1,895 miles) away had inundated the area, and in their dying breaths, the fish had inhaled some of them. X-ray image showing spherules embedded in a paddlefish gill. The researchers point out that there are other scenarios that might have brought the glass particles up to Tanis. Maybe there were meteorological events like gale-force winds, or landslides, the authors write in the paper, which will be published on Monday in PNAS. “Observations at Tanis expand our knowledge of the Chicxulub impact’s damaging effects and their far-reaching scope. The highly probable link between impact-induced seismic shaking and the onshore inundation surge at Tanis reveals an important additional mechanism by which the Chicxulub impact could have caused catastrophic conditions in the Western Interior, and possibly worldwide, far from the impact site. It’s amazing to imagine how abruptly life on Earth changed in the hours and days after the Chicxulub asteroid hit. And it’s equally amazing that we could find direct evidence from that time locked away in the remains of the creatures who experienced it.